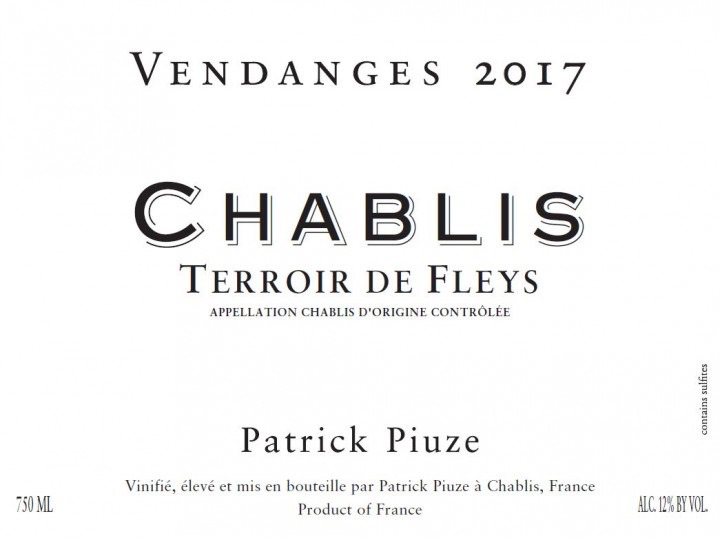 Wine Patrick Piuze Chablis Terroirs de Fleys 2017 - Royal Wine Merchants - Happy to Offer! Fleys, from a vineyard near the eponymous village is on the right bank of the Serein and is very near to the 1er Cru Mont de Milieu. Normally the village level wines are fermented and aged in tank, this vineyard has such great quality, that Piuze treated it like his 1er and Grand Cru vineyards, fermenting and aging the wine entirely in neutral barrels for ten months. A beautiful nose offers excellent Chablis typicity with its array of oyster shell, sea breeze and citrus scents. Once again there is good volume and richness to the caressing medium weight flavors that conclude in a sappy, markedly dry and refreshing finish that evidences a bracing salinity. “Here is a truly thrilling new producer of hand-crafted Chablis, designed to showcase the individuality of different terroirs, not just at premier (and one grand) cru level, but within that very substantial area devoted to AC Chablis.” -Jancis Robinson “This is the best address to explore the Chablis AOC, as Piuze produces a number of cuvées and lieu-dit bottlings designed to highlight the diversity that this large appellation encompasses. 2017s at this address are an unmitigated success, classic in profile, with charming fruit but tangy balancing acids.”— William Kelley Wine Advocate.